For questions, check out Egress FQDN FAQ or learn more about `FQDN here <https://www.aviatrix.com/learning/glossary/fqdn.php>>`_. The instruction below assumes there is already an Aviatrix gateway running in the VPC where you wish to deploy FQDN filter. If not, follow the Egress Control workflow to first launch a gateway. Click “Attach Gateway” to attach a gateway to the tag. Repeat Step 3 if you have more gateways that should be attached to this tag. 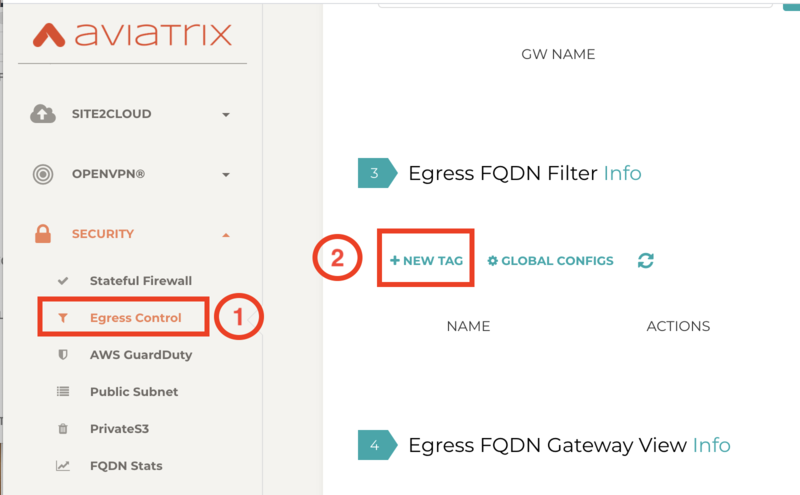 Repeat from Step 1 to create more tags and attach to the same gateway or different gateways. 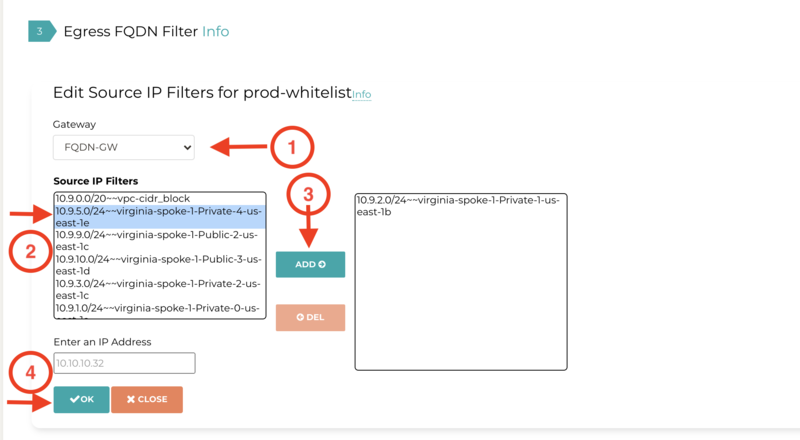 However, if multiple tags are attached to the same gateway, then mode (Whitelist or BlackList) must be identical. Exception Rule is a system-wide mode. When Exception Rule is enabled, packets passing through the gateway without an SNI field are allowed to pass. This usually happens when an application uses hard-coded destination IP address for HTTPS connection instead of domain names. When Exception Rule is disabled (uncheck the box), packets passing through the gateway without SNI field are dropped unless the specific destination IP address of the packet is listed in the Whitelist. The use case could be that certain old applications use hard coded destination IP address to access external services. This feature is available in Release 3.4 and later. The download file from Export from a different tag. A text file in the format compatible to Export. Edit Source is available in Release 4.0 and later. Edit Source allows you to control which source IP in the VPC is qualified for a specific tag. The source IP can be a subnet CIDR or host IP addresses. This provides fine-grained configuration. For example, one use case is if you have two private subnets in a VPC: one deploys dev instances and another deploys prod instances. With Edit Source feature, the dev instances can have a different tags than the prod instances. Edit Source assumes you already attached a gateway to a tag.